Bill seems to be very interested in solar system objects, particularly the Sun and the Moon. His purchase of a Coronado Personal Solar Telescope (PST) a few years ago has literally changed his life. Bill is currently experimenting with technology. 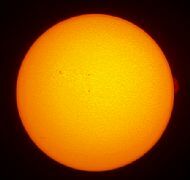 Great disk detail on this image by Bill taken on 4th Atpril. Notice the waterfall prominence on the right side of the disc! There is a faint filament amongst the sunspots too. Taken with Nikon Coolpix 950, through Helios 20mm Plossl, Coronado PST, on motor driven Astro-3 equatorial mount. The disc details were produced by stacking 20 images using Astrostack, each one 1/275 sec at f/6.6 (auto exposure), the prominences from 5 exposures aligned and merged using Photoshop, each one 1/40 sec at f/6.6, overexposed by 2 stops. The disc and prominence images were combined and colorized using Photoshop. Another solar image taken using a Coronado Hydrogen Alpha PST telescope and digital camera (Coolpix 950). 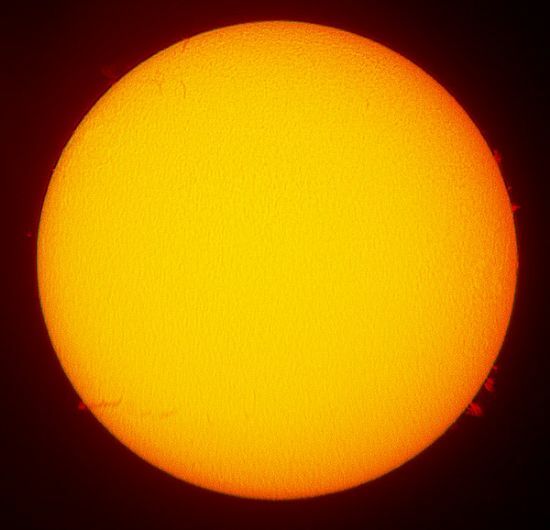 No sunspots showing but there are several prominences and some obvious filaments too. Just goes to show, even at sunspot minimum there is still plenty to see of the face of our closest star. Multiple images stacked using Astrostack software and further editing done using Photoshop. Telescope and camera mounted on motor driven Astro 3 equatorial mount. This was taken using Bill's new replacement Hydrogen Alpha PST (Personal Solar Telescope). He describes it as just a quick shot, with 20 images stacked in Registax4 and some wavelets added. He then used Photoshop to bring out the prominences and adjusted the disc to enhance the detail. So that's a quickie eh? Can't wait to see one he spends some time and effort on....! 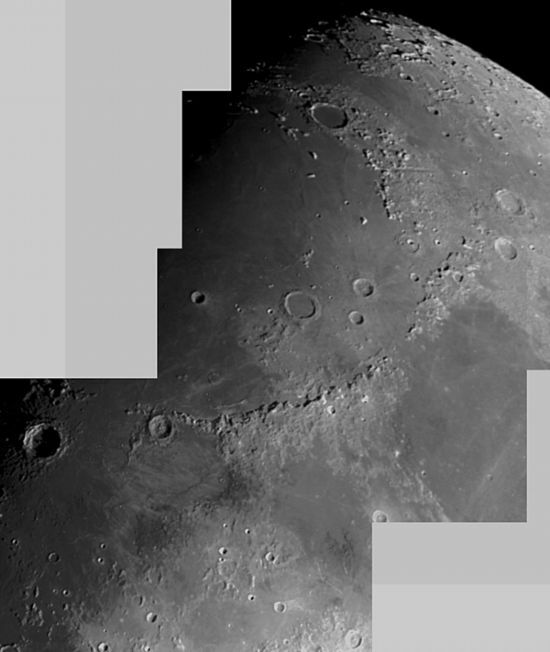 Mosaic of lunar images captured using Philips SPC 900 webcam (640x480 CCD chip) modified to fit into ETX-90RA Maksutov. The mosaic comprises four images, each constructed of about 270 frames captured in movie mode at 5 frames/second. The frames were stacked and slightly tweaked using the wavelets function in Registax, and then further tweaked in Photoshop. Photoshop was also used to construct the mosaic, and Levels feature was used to try and match the images to each other and make the joins as seamless as possible. Images captured on Tuesday 18th December 2007 at -3'C!